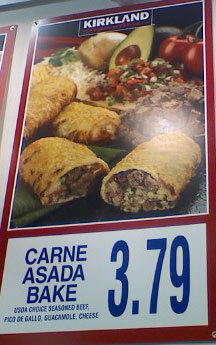 Costco now has Carne Asada Bakes (much like Chicken Bakes) in some of their test stores (such as Livermore, CA). I asked an employee about them and he said they were the best thing they’ve got in the food court. Hopefully it passes the initial test and rolls out to the rest of the Costcos. I’ll update you as I get more information. It is now at Las Vegas, NV as well. Thanks Rebekah, anyone else seen the Carne Asada Bake at an unlisted location? Has been at the Victorville, Ca location for a few weeks now. Poway, CA; Carmel Mountain Ranch (San Diego), CA; Morena (San Diego), CA…most of the ones in the San Diego area, as we were a tester market for the product. Marysville, Washington also has them. Just tried one last night. Pretty good. The picture looks like the wrap is more flaky like a chimichanga (sp?) wrapper, but Costco uses the same bread wrapper as the chicken bake. A flakier crust would probably taste better, but may be more expensive for Costco to procure. I think the carne asada needs a bit more salt and a little more flavor. Maybe some cumin or garlic would do the trick. Simi valley costco has em! Pretty gooD stuff! They’re also at the Richmond, CA store. i guess i will just have to drive to the nearest location to taste this. The pico, gauc, cheese, spices were balanced very well. Leaked, the beef seemed to only added texture no “beefy” flavor. At least 25% of the bake was “empty” no filling. My wife and I had one of those Carne Asada Bakes. If you are expecting the same flavor as a carne asada burrito common to Southern California, it is not the same. But it was tasty and there was diced beef steak in it. The only thing I would add to it would be either some fresh salsa or pickled jalapenos. I sure appreciate Costco providing condiments with their hot dogs, I would hope they would think about these kinds of other latin condiments for their Carna Asada bakes. Then I would really enjoy it. they have it at the Alhambra Costco, too, and have had it for some time now. I’m eating one. it’s delicious. They have them in the DC suburb Landover, MD. I had one yesterday at noon in Simi Valley. The outside was too tough to bite into without ripping up the bake itself. The flavor of this thing was just terrible. The salsa was plain, I saw no guacamole inside, and I saw very little meat, I won’t be having it again. Just had one today at the Salt Lake City store. Pretty good for less than four dollars! 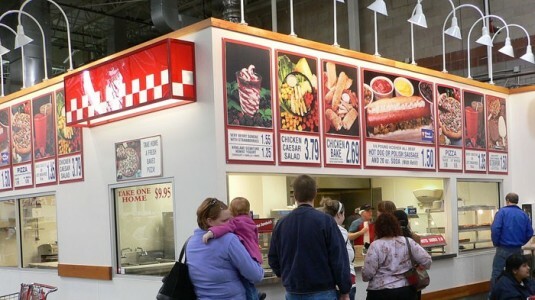 Post Nutritional Information on the Carne Asada Bake and other Food Court items. just had one today, my wife had the chicken bake, if you’re faced with a choice, go chicken, this is a fairly tasteless item, and the chicken is much more rich and satisfying.